Wind 10-15 Knots...Batteries Full...Thanks, Ferris! 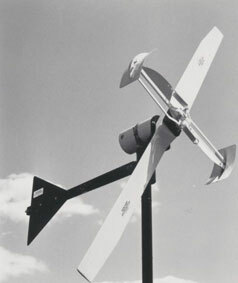 The rugged Ferris WindPower 200 has a host of advantages over other models on the market. All WP-200 Wind Systems deliver high charging power in relatively low winds starting in a 5-knot breeze, as well as super-QUIET operation even in high winds. Unattended, fully automatic operation is achieved with our Overspeed Governor and Multi-Source Regulator. This unit has slip rings for full wind-seeking ability and is commonly mounted on a pole on the aft deck of a boat or near a house. Pole mount installation kit sold separately. 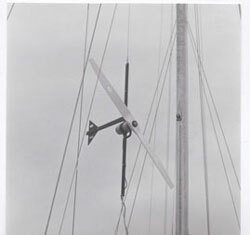 This model raises like a jib in the fore-triangle or on a backstay of a boat. It is perfect for combination wind/water systems as it is easy to convert and allows for clear decks on a long ocean passage. All models can easily convert to a Water Powered Generator for long ocean passages. The WP-200 can be used on its own or in combination with other charging sources such as a High Output Alternator or a Solar Charging System. The WP-200 Easily Produces Over 200 Amp Hours Per Day! These Wind-Powered Packages take the guesswork out of system design and installation. Each package includes the reliable WP-200, 20 Amp Wind Powered Generator, Multi Source Regulator, Wind/Water Generator Monitor which shows charging output and our Overspeed Governor for high wind speed protection. This combination provides a complete and professional installation.